Google shopping has just been updated into the new format that we have been expecting for a while now. In case you have been on holiday recently and are just back in the office catching up on your digital marketing research here’s a summary for you… If you are an e-commerce business selling products online this is going to impact you quite significantly, so stock up on caffeine and listen closely! If you currently don’t have an AdWords account but used Merchant Centre you need to get an AdWords account set up ASAP, and link it to your Merchant Centre in order to still appear in the product search section of Google. Previously, you were able to provide a feed of product data to Google via the Merchant Centre and they would very kindly accept this data and display your products within the shopping section of Google (assuming you set the feed up correctly). This was great as it was quite simple, and clicks from the product search were free. This was the only way to get in Google shopping results. There has also been a Google product called “product listing ads”, which is similar in that it runs from a feed but was integrated with your AdWords account. 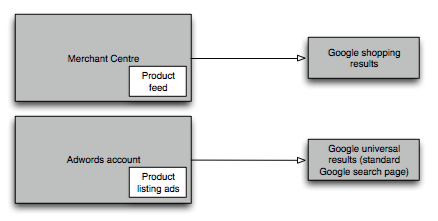 This area had more control than the product feed alone but used a cost per click model like standard paid search. Both of these areas we would recommend and use with all of our e-commerce clients. OK so going forward they are removing the free section of this, and although everything will still use a feed via the Merchant Centre it will all be controlled from your AdWords account and will all be part of the paid model. So good news and bad news really. You will lose the free traffic you got from Google Product Search, however you will have a lot more control and ability to optimise the Product Listing Ads (PLA). We have been working with product feeds and optimising them for PLA for a while now so do get in contact if you need a hand! Feel free to comment below with any questions.